Who is Love-Squared? Oh, just one of StickerGiant’s fantastic fans on Facebook. 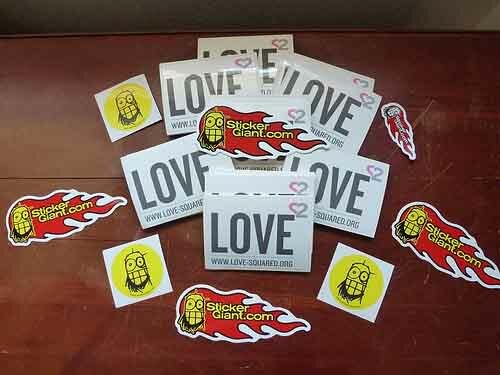 Who recently placed a custom sticker order with us to promote themselves. Who's our latest Fan of the Week. You know, because what they do is INCREDIBLE! Love-Squared is a volunteer based organization making afghans for our country's homeless children. Our mission is to provide some comfort, warmth and a lot of love to our homeless children. Starting local with Ohio and Michigan until we get enough people to help our country's homeless children. Which is why we’re sending them a box of yummy cookies from our neighbor, Mary’s Market & Deli. Enjoy, Love-Squared! Keep up the warm and wonderful work! And thank you for choosing StickerGiant.